I love travelling, and when the Transport secretary informed me that I have been included as part of the delegates for the first ever Imphal-Mandalay Bus Service trial run from 9th December to 14th December 2015, my excitement knew no bound and I eagerly looked forward to it. At long last, I could visit the mainland of our neighbouring country and no longer claim of having visited Myanmar by merely setting foot inside Tamu, the border town, every time I visit Moreh. The bulk of the delegates consisted of officials from various Deptts of the State Government and some civil reps as well as the main tour operator Seven Sisters Tour agency. There were also representatives of Ministry of Road Transport Highways (MORTH), MHA, Customs, etc. The proposed route we were to take was Tamu-Bagan via Kalemyo-Monywa-Mandalay-Neypitaw. The journey from Imphal started right after the formal flag off ceremony on 9th Dec., 2015 at Hotel Imphal. The vehicles consist of one bus and two SUVs, and it took barely three hours to reach Moreh. But the immigration and custom clearance at Moreh took time and we finally headed for the border gate at 2.35 pm. After crossing the India-Myanmar border bridge, we found the Myanmar officials waiting for us since morning. After a brief halt at their immigration and custom check-post, the Myanmar officials informed us that as per their schedule for us, we were to arrive at 10 am at the border and we have to drive from the border straight to Monywa via Kalemyo-Yargyi route. This was unexpected, as according to our plan, we were to halt the night at Kalemyo, and we requested that we stick to our schedule. But ultimately, we yielded to their schedule for us. So, we had to brace for a long journey ahead. At 2.45pm IST, we started off from the Tamu border gate for Monywa led by the Myanmar Transport Director U Thin Myant Thu. After two and half hours journey, just before reaching Kalemyo, we stopped by at a roadside eatery for tea and snacks. The sun had already set by then. Thereafter, the night journey commenced. It was not long when we reached the bad stretch of Yargyi road. The kuccha journey began, with our dust covered vehicles trudging the lonely road at night. Even after hours and hours of driving, there doesn't seem to be no end in sight of the bad stretch (of 113 km). Finally, after an arduous and back breaking six/seven hours drive of the bad stretch, we reached Yargyi roadside restaurant at around 1.30 am, where we had our dinner. Interestingly, the whole bad patch of road is the hilly portion of the route. In twenty minutes, we started off again and thankfully the road was no longer bad and plain all the way. At Monywa, we arrived at 3.30 am and straightaway checked into a Hotel. Some managed to get some winks for a few hours, while some of us early risers, it was difficult to get a good rest. After a sumptuous breakfast, we left Monywa city at 9.30 am for Bagan town. No bad stretch of road any longer and it was a smooth drive by and large. We reached Bagan town in the afternoon after journeying for more than 5 hrs, where we stayed for the night at Bagan, and in between did some sightseeing. The place is known for Pagodas, the culture and religion of Budddha aura pervading everywhere. The next day, we headed for Naypyitaw, the new capital city of Myanmar. The drive to Naypyitaw took more than 6 hrs, covering more than 400 km. The highway leading to Naypyitaw, was smooth and wide. It was clear that Myanmar has put up its best to make the new city swanky clean, spacious and modern. From what I could gather, the city and the roads were constructed by China through the funding of the Asian Development Bank. Unlike other routes, there was not much of habitation seen either side of the highway all along. On reaching Nay pyi taw, we were accommodated at a sprawling hotel with beautiful campus, neat, clean and serene. A warm reception was held for us by the Director General of Road Transport, Myanmar, in the evening with a cultural show and a grand dinner. After a wonderful rest and night halt at Nay pi taw, the next morning we left at 7.45 am for Mandalay. This time, the Myanmar delegates who would be travelling back with us up to Imphal joined us from Nay pi taw. At 11.20 am, after covering a distance of about 320 km( google says its 269 km), we reached Mandalay city. Mandalay is a beautiful, vibrant city with bustling commercial activities. After settling down, we went to the reception arranged by our Mandalay Indian consulate at Sadona Hotel conference hall. There, we were welcomed by the Consulate General Mr Nandakumar, a young IFS officer of 2007 batch. The delegates of both countries i.e India and Myanmar, along with high officials of Myanmar including the CM of Mandalay and our country's ambassador to Myanmar, Mr Gautam Mukhopadhyay were present. The meeting, which was more of an interaction opportunity for both sides, was excellent. From the Indian side, Mr DK Sharma of MORTH made a power point presentation on IMT MVA. While Myanmar officials also made presentations on their business opportunities available, investment by other countries etc. In the evening, there was a separate dinner arranged for the Indian delegates and the Myanmar delegates at a lakeside Restaurant. It was during this course of interaction that I came to know that the delegates consist of mostly businessmen (members of chambers of commerce of Myanmar). I did a hard selling of Manipur as being the nearest state of India with a lot of potential for business. Health care facilities, educational avenues etc were available and easier to access for Myanmar. After a lot of hard thinking, I conveyed and discussed this aspect to Mrs Roshita, Director Transport, Dr Chinglenkhomba, Dy Director(Tpt), Mrs Romita, Dy Sec(Tpt) and Mr M Lokendro CE PWD, and to other delegates who were with us in the journey. So, what we needed was to arrange for showing some of the excellent Healthcare facilities, like Shija Hospitals, Babina diagnostics, JNIMS, RIMS, Manipur University, Central Agriculture University, Tourist spots etc and also for interactive session with business enterprises and entrepreneurs of the state so that opportunities are created through exchange of ideas and contacts and enhance prospects of business growth for the state. Thanks to easy telecommunication and internet, these were conveyed to our officials in the state and were arranged timely. I am sure this opportunity was not wasted at all, judging by the interactive session that I saw later in Hotel Imphal on 15th Dec 2015 noon. The next day, we finally set off for our return journey to India along with the Myanmar delegates. Along the way, after passing through the same rough patch of the Yargyi road, we reached Kalemyo at 9.30 pm where we halted for the night. At 8 am we started for our homeward journey again and reached Tamu at 11.15 am where we had our lunch and later on went to the immigration for formalities. By the time we reached Indian side of Moreh town, it was 1.30 pm. Usual formalities at our immigration and customs checkpost and then we journeyed for Imphal at around 2.15 pm and landed at Hotel Imphal by 5.45pm. A few observations during the course of the journey were that Myanmar people's hospitality is indescribably wonderful, and the people warm and courteous. Contrary to our beliefs, the roads were by and large very good. The cities were seen bustling and thriving and tourists from Thailand, Japan, Laos, as well western tourists were seen in large numbers. It would be erroneous to say that the roads are bad just because we travelled through a bad patch of Yargyi road. In fact this route seemed to be an old road and no longer much in use. For India, this route is important as this would shorten the land route for Mandalay. 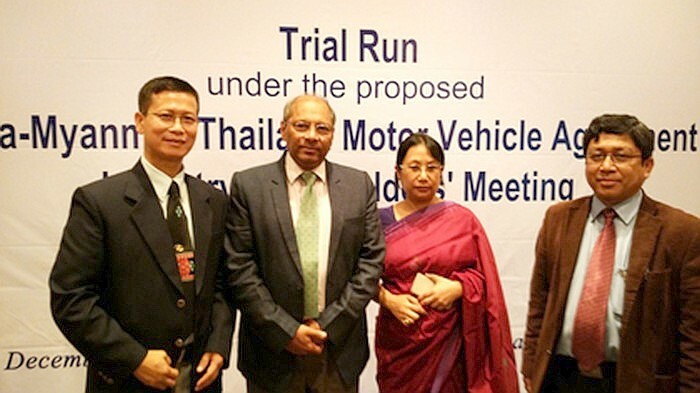 Another observation is that, while we see the journey as Imphal-Mandalay only, the larger aspect of this is that India, Myanmar and Thailand (IMT) are expected to sign a trilateral agreement on MVA( Motor Vehicle Agreement) hopefully by early next year. Right now negotiations are still on and we do hope once this is signed, both countries may also look into the feasibility of visa on arrival at the border to facilitate easy movement of tourists too. The IMT-MVA is expected to facilitate regional integration of the three countries through land transport and boost trade and transport between South and South East Asian countries. This will also reduce transaction costs, closer people to people contact between the three countries and boost tourism too. In fact, it is expected to open windows of opportunities for various South East Asian countries and India through land transport of cargos, freights and passenger services. For Manipur too, the IMT-MVA once signed, will not only usher in the long cherished dream of easier movement for Manipuri people now settled in Myanmar, but also by virtue of being the nearest state of the country to Myanmar, it is imperative that we explore opportunities for trade and commerce, strengthen our people to people relations, hard sell the facilities that we have for Myanmar people to avail, and also look for business opportunities in Myanmar. It is time we do our homework, before others grab the chance. This article was posted on December 19, 2015.